Dazzle in this gold sequin short holiday dress that shimmers for seasonal celebrations, office parties, and New Year's Eve events. With a futuristic look, the sparkling short party dress features a modest high neckline and ruffled short sleeves. A uniquely angled ruffle provides fullness to the hemline of the short a-line skirt for a look that is whimsical and figure-flattering. 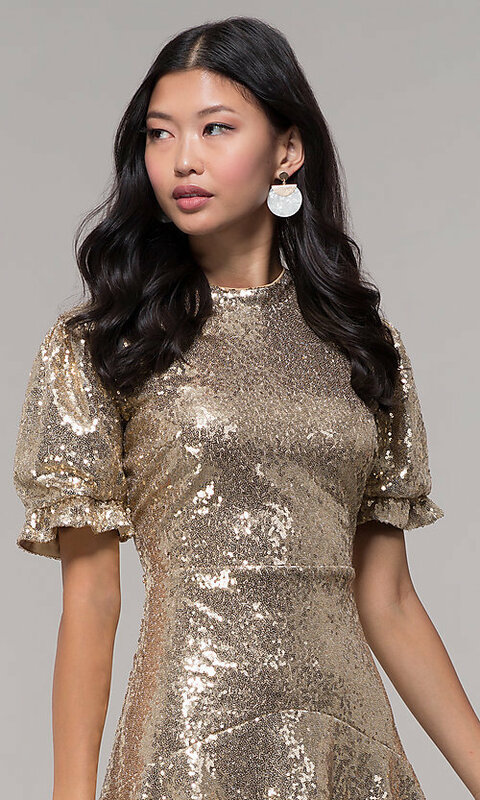 As good as gold for your semi-formal event, this short sequin holiday party dress shines brightly for a lasting impression.